Ubisoft announced its sales results for the first quarter of its 2015-16 fiscal year, and while that sort of bidness news is not normally the sort of thing we devote too much time to around these parts, the report includes some very interesting figures regarding Ubisoft's sales on the PC. The company reported sales for the quarter of €96.6 million/$106.7 million, a drop of 73.2 percent compared to the €360.1 million/$397.8 million earned over the same period last year (during which it released the big-selling Watch Dogs), but still well above the target of €80 million/$88.4 million. The strong performance, Ubisoft said, was driven largely by continuing strong sales of Assassin's Creed: Unity, Far Cry 4, The Crew, and Watch Dogs. Digital sales are also way up, totaling €54.1 million/$59.8 million and representing 56 percent of total sales, compared to just 23.2 percent last year. All very nice. But what's interesting to us is the way those revenues break down by platform. The PC accounted for 23 percent of Ubisoft's sales this quarter, an amount only (and only slightly) surpassed by the PlayStation 4, which totaled 27 percent of sales. Xbox One sales made up just 11 percent of Ubisoft's sales for the quarter, as did the Xbox 360 and PlayStation 3. The Wii U came in a distant last with three percent, and "other"—mobile and ancillaries—grabbed the remaining 14 percent. The PC's 23 percent share also represents a dramatic increase over the 14 percent of total sales last it achieved last year. 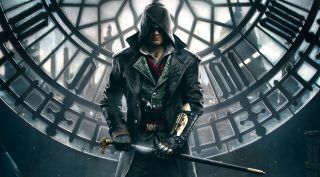 The figure is surprising not only because it's so high, but because it's Ubisoft, which has acquired something of a reputation for dropping the ball (off a cliff) when it comes to the PC, most notably with the fire-in-a-pet-shop launch that was Assassin's Creed Unity. Maybe I'm being too trusting, but it could also indicate that the company is serious when it says it's done dicking around. Money talks, as they say, and in this case seems to be shouting rather loudly.